Co-written by popular fantasy and science fiction author Diane Duane (and loosely based on her 1983 Star Trek novel The Wounded Sky), “Where No One Has Gone Before” blew my tenth grade mind when it first aired. All that talk about the unified nature of space and time and thought seemed like really radical stuff to me in 1987. Twenty-five years later, of course, my sixth grade son routinely chooses to watch physicists like Brian Greene discuss quantum dimensions and string theory on PBS, and the Traveler’s quasi-mystical hints about the true nature of reality no longer seem quite so heady, but they evoked a sense of wonder in me at the time that I fondly remember. When I decided to comment on this episode, I thought I’d be holding forth about how it invites those who see the cosmos through eyes of faith to marvel at the majesty of God’s creation—not only the breathtaking vistas of the cosmos more beautiful than anything a visual effects team could concoct, but also the frankly amazing capacity of the human mind to understand so much of God’s handiwork. We’ll never grasp it all, but the fact that God has given us minds to unravel so many of its mysteries is breathtaking. I thought the episode would provide fodder for my Psalms 8 and 19 “files,” those mental folders where I mark movies, TV, and books that highlight science fiction’s ability to point toward the glory of God and the dignity of humankind as created by God (even if the artists involved didn’t set out to do so). 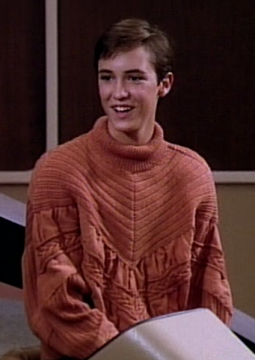 As I watched “Where No One…” for the umpity-umpth time, however, a different theological theme struck me—and I have Wesley Crusher to thank for it. Now, I wasn’t ever really a Wesley hater. Not having access to the then-fledgling Internet, I didn’t know about message boards and discussion groups with such cheery names as “alt.wesley.die.die.die.” Sure, Wesley got stuck wearing some goofy sweaters (think Cliff Huxtable’s wardrobe on a tricordrazine overdose), but it was the 80s—who didn’t? And, no, he was never my favorite character, but I appreciate him for what he was: one Eugene Wesley Roddenberry’s nostalgic, idealized vision of his younger self, bursting with potential but, through no fault of his own, unable to express it. The sickly, shy, bookish, eight-year-old Roddenberry dreamed, he says, “of a better world in which people would look past our exteriors and see whatever loveliness we have inside us.” In response to his parents’ no doubt well-intentioned concern for him, he reflects, “Ah, how lovely all our daughters are inside, how fearless all our sons, if only we could see it.” These are beautiful thoughts, and every parent would do well to take them to heart. Roddenberry didn’t write “Where No One…,” but this yearning of his, on behalf of all the misunderstood ones, to be seen in a new way, to be gazed upon with a vision that penetrates the superficial to plumb our depths, clearly informs it. TRAVELER: [Wesley] and a few like him are why I travel. You have it in your power to encourage him without interfering. 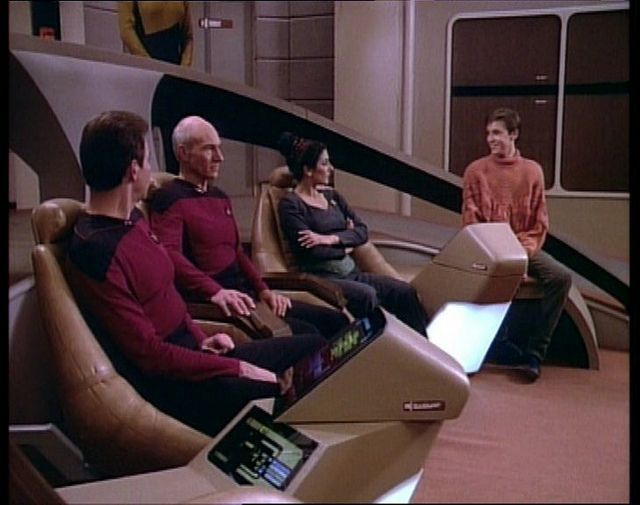 PICARD: Encourage him? In what? TRAVELER: How shall I explain? Are you familiar with the intricacies of what is called here music? 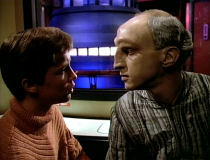 For much of TNG’s first season, Wesley was called “the boy.” At one point in this very episode, in fact, he feels compelled to speak up for himself: “I have a name!” Wesley is tired of being ignored or, worse still, told to “shut up” because he is young. Commander Riker confesses that Wesley tried twice to tell him about the Traveler’s connection to the Enterprise’s amazing velocity, “but I wouldn’t listen.” For all that he usually kinder to Wesley than the visiting Kosinski is, he here betrays the fact that he, like that arrogant propulsion expert, thinks of Wesley as “this child.” Wesley’s gifts and skills defy expectations and convention, apparently even in the advanced and enlightened twenty-fourth century Federation. The adults around Wesley can’t or won’t look past his exterior to see the loveliness he has inside. 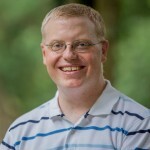 And so Wesley makes me think of a young shepherd boy from Bethlehem who, at first, wasn’t even called in from the fields when the prophet Samuel came looking for Israel’s future king; the same boy who volunteered to fight Goliath the Philistine when none of the real soldiers would, and who was initially laughed at and brushed aside for his boldness. No human being saw David’s gifts and skills, his present resources and his future potential—but God saw someone after God’s own heart. “The Lord does not see as mortals see; they look on the outward appearance, but the Lord looks on the heart” (1 Samuel 16.7). Scripture contains many other examples of God looking on hearts we mortals might deem least likely of attention. Who were Abraham and Sarah, out of all the families on the face of the earth, to be chosen to bear blessing to the rest? Who was Moses, a murderer on the lam, slow of speech and slow of tongue, to go and tell old Pharaoh, “Let God’s people go?” Who was Ruth, the young Gentile widow, to become the great-grandmother of Israel’s greatest mortal monarch? And who was the teenaged virgin from Nazareth to become the mother of the Messiah? You could no doubt add to this biblical roll call. The pattern persists: “the Lord our God, who is seated on high,” nevertheless “raises the poor from the dust, and lifts the needy from the ash heap, to make them sit with princes, with the princes of his people” (Ps. 113.5-8). In Star Trek terms, God sees the people whom others overlook and elevates them to the rank of “acting ensign”—or better! For, where Picard commissions Wesley after the Traveler vouches for Wesley’s nascent genius, God chooses those who will further God’s purpose for no reason other than grace. As Paul, quoting Genesis, says of Abraham, “We say, ‘Faith was reckoned to him as righteousness’… Now the words, ‘it was reckoned to him,’ were written not for his sake alone, but for ours also. It will be reckoned to us who believe in him who raised Jesus Christ from the dead, who was handed over to death for our trespasses and was raised for our justification” (Rom. 5.9b, 23-25). In Jesus, God confers on those who believe a “rank” we do not deserve, but can live out and live into with joy and gratitude. The next time you and I are tempted to discount or dismiss someone—and God knows, literally, temptations abound, in our personal lives, in our workplaces, in our nation’s currently hyper-partisan political season, and elsewhere, to shout a big, fat, “Shut up, Wesley!”—remember not only the Traveler, but also and more importantly, remember Jesus. As Paul reflects, “even though we once knew Christ from a human point of view, we know him no longer in that way,” and so we ought “regard no one from a human point of view” (2 Cor. 5.16). Rather, we should regard all people as beings of value and worth—not because they can necessarily make music with time, energy, and propulsion, but because they, like us, are people whom Jesus loves and for whom he died and rose again. We may or may not ever know how God is at work in their lives, but we believe that God is, for the one God “desires everyone to be saved and to come to the knowledge of the truth” (1 Tim. 2.4). And the very people we may be tempted to ignore or exclude may just be the ones on whose heart God has already looked in favor, and through whom God may be seeking to lead us where we, at least, have never gone before. Next Week: How does Commander Riker in “Hide and Q” help us (re)define divinity? Rewatch the episode and share your insights in the comments below! Scripture quotations from the New Revised Standard Version. 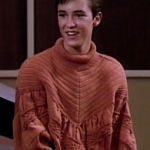 This episode had long been my favorite of TNG. I think it was replaced by Measure of a Man and The Drumhead as I grew up. Your comments about accepting others and not succumbing to our negative expectations of them is wonderful. Wesley is just the perfect character to illustrate the need for this virtue. So many season 1 episodes of TNG would have been much shorter had the captain practiced this! I think your main point is also contrasted well with Kosinksi. He starts off as a brazenly elitist jerk. And as his theory is proven to function only when the Traveler is at the wheel, his attitude shifts. He doesn’t become a nice guy exactly. But he definitely mellows in the face of such humiliation. With his expertise revealed to be mostly a sham, he stops boasting immediately. And, for any respect to shown to him, he must rely on the only thing he has left: his basic identity as a human. If any character in this story is deserving of nasty treatment (like being told to shut up on the bridge), it’s Kosinski. But he’s dealt with pretty mildly after he was exposed as a fraud. With nothing to offer, he just clams up and goes away. Wesley and Kosinski are great counterparts. One is bombastic and wrong. The other is humble and right! I know which one I am ashamed of acting like sometimes and which one I strive to be! I’m glad you bring up Kosinski, Mickey. I had wanted to, but was running long (as is my wont). First off, Stanley Kamel plays this character so perfectly. My favorite guest start of season 1 by far. And you’re right: he’s never fully “redeemed” per se, but he does mellow — and, what really stands out to me is that, in his own way, he, too, is the beneficiary of the Traveler taking notice of him when (presumably) others didn’t (“Is Kosinski a joke?” “No… he has sensed some small part of this.”) And Kamel sells me on the plot point that Kosinski really had deluded himself into thinking that he really was doing something. Like many of us, he has an inflated sense of his own abilities – but that doesn’t mean he has no abilities. And while he does by and large “clam up and go away,” as you say, the Traveler specfically requests his help during the final flight. Kosinski doesn’t have as much to offer as he thought and as he tricked others into believing, but he *does* have *something* to offer. I have often wondered what his career in Starfleet was like after this episode. Maybe with the crisis safely averted and some sense knocked into him, Kosinksi went on to make some valuable, authentic contributions of his own. I’d like to think so, anyway. As ever, thanks for reading and commenting! You are quite right that Picard needed to be more patient with lots of folks early on in TNG. And, while I haven’t quite finalized my list of 25 (well, now, 23) choices (shh! don’t tell! ), you can be certain “Measure of a Man” will be on it. Good stuff, Michael! I’m thinking about rewatch TNG episodes on the days they originally aired, and this will provide some awesome supplementary reading! I only have a couple episodes to catch up on if I plan to do it, but this episode I’ll probably skip. Why? Because this was one of the episodes they showed in theaters for the 25th anniversary release of the Blu-Ray set a month or two ago! I love TNG, but there are very few episodes I can stand to rewatch without a long buffer period in between them . . . Thanks for taking the time to read and comment, Ben. I do still love this episode, and would’ve loved to have seen it on the big screen.